Behind his observant and logical Financial Adviser shell, Bill Calvert is a humorous and venturesome man. You need some sense of adventure to live out here, and he certainly does! 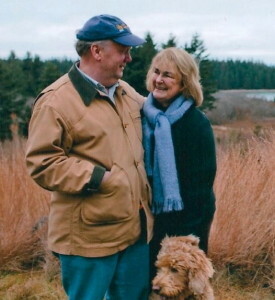 Bill and his wife, Nancy, first came to Maine in the 1970’s. He was working as a tour operator – leading biking, skiing, canoeing and whitewater rafting trips. That is when they first discovered Isle au Haut. A change in career from outdoor adventurer to Financial Adviser led them to Connecticut. However, hey never forgot their Penobscot Bay adventures and came back to Isle au Haut. The Calverts eventually purchased land on the island in 1999. That same year, they made Portland their home base. Once their island home was built, they split their time between Isle au Haut and Portland. In 2012, they sold their Portland house and moved to Isle au Haut full time. While Bill’s office is still in Portland, he is able to telecommute with a business trip off island every other month. Bill and Nancy are an outstanding asset to the year-round community; both volunteering their time on local boards and always up for hosting the best dinner parties and musicales!